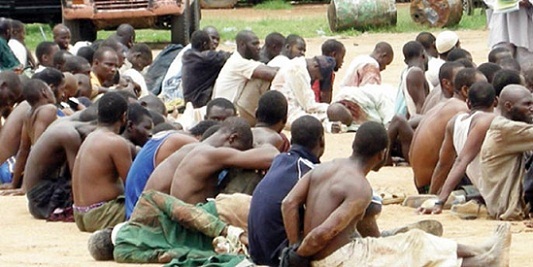 The special court trying detained Boko Haram suspects has convicted another set of 113 sect members. Sitting on Monday and Tuesday at a military formation in New Bussa, Niger State, the courts sentenced the sect members to various terms of imprisonment. The three judges handling the cases are drawn from the Federal High Court in the trials witnessed by rights advocacy organisations like the National Human Rights Commission (NHRC) and Amnesty International (AI). There was also a team from the Legal Services Department of Nigerian Prison Service (NPS), which included ACP Godwin Okosun. The prosecution and defence teams were made up of lawyers drawn from the Federal Ministry of Justice and the Legal Aid Council of Nigeria (LACN). The Nation reports that a total of 111 suspects were set free because there were no sufficient evidence to prove their guilt. They were recommended for rehabilitation before release. All the cases heard involved defendants who could only speak either Hausa or Kanuri, thereby requiring the assistance of translators. The ages of the suspects varied, the lowest being 16-year-old Saudatu Zarhadeen, who was arrested at 13 years by security agents, who had gone to their home to arrest her husband, a suspected Boko Haram leader, but picked her in his absence. The oldest was 73-year-old Mamman Lawan, who was among a set of five men convicted for concealing information from security agents, about the activities of Boko Haram and offering assisting members of the sect with foods and other items. Lawan was, along with other four – Modu Bulama (40 years), Mallam Dupochi (50), Mallam Ali Mami (63) and Musa Mohammed Dawa (60) – sentenced to three years each per count of a four-count charge. There was the case of Banzana Yusuf, who admitted being part of some Boko Haram members, who kidnapped the over 200 Chibok schoolgirls in Borno State in 2014. Yusuf also admitted stealing a military vehicle in Mungunu, part of which they used to convey the abducted girls. He said his parents in 2008, sent him to Lagos to prevent him from joining. Boko Haram, but that he chose to return to be part of the group. He was convicted and sentenced to 20 years imprisonment, to run from when he was arrested in 2015. Thirty-year-old Kabiru Mohammed got the highest sentence of 30 years per count of a seven-count charge in which he was accused of among others, being a member of Boko Haram and participating in series of fatal attacks on communities. Mohammed was said to have joined the sect in 2013 and rose to become a leader in 2014. He was said to have participated in the attack on Bama (Borno State), Konduga, Baga and Damaturu. He pleaded guilty to the charge. Adamu Muhammed (22), was arrested when he was19 years. He was charged with being a Boko Haram member, participating in terrorism activities and killing six people with a gun. He pleaded guilty to the six-count charge on which he was arraigned. He was convicted and sentenced to 25 years imprisonment. Mohammed Musa Audu bagged 15 years for admitting being a member of a terrorist organisation called Mujahideen. He admitted attending the group’s meetings in Mali. He denied being a member of Boko Haram. The much anticipated trial of Mohammed Zakariya (aka Butcher) was postponed when the judge learnt that the 50-year-old man was mentally unstable.